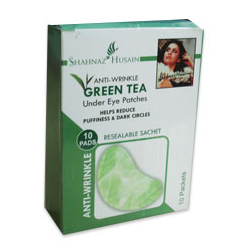 Buy Shahnaz Anti-Wrinkle Green Tea Under Eye Patches - Reduce Puffiness & Dark Circles, Restore Skin Natural Moisture Balance. Gives Soft Skin & Youthful Skin.Free Worldwide Shipping. Shahnaz Husian - Anti-Wrinkle Green Tea Under Eye Patches - Soothes Tired Eyes and Helps Reduce Dark Eye Circles. Containing natural extracts of green tea, rose and aloe vera juice, the Anti-Wrinkle Green Tea Under Eye Patches help to restore the skin's natural moisture balance. The skin appears instantly revitalized. Regular use helps to reduce fine lines and wrinkles around eyes, making the skin look soft, smooth and youthful. 4.Peel off patches. Once removed, massage in excess liquid, if any. 1.Discontinue use if skin sensitivity or irritation occurs. 2.Avoid contact directly with eyes.